At first pour, Founders’ fall brew doesn’t make a huge impression – the jet black color is promising for stout lovers, but the nose offers hints of coffee, but not much else. And then you taste it. Oh my God, do you taste it. The Michigan-based Founder’s Brewing uses loads of “bitter and imported chocolates” in this beer, which has become a classic example of what a breakfast stout could/should taste like. The “loads of chocolate” claim is immediately verified upon first sip. The “Double Chocolate” written on the label doesn’t prepare you for the rich dark chocolate punch that’s delivered as soon as the beer hits your tongue; it’s like biting into an 85% cacao piece of chocolate. Just before it gets too sweet, the Kona and Sumatra coffees in the brew step up and give the stout a great bitter finish. Let the beer warm up a bit; the chocolate and coffee notes get stronger as the beer loses its cool. Its smooth, rich feel coats the tongue and lingers. 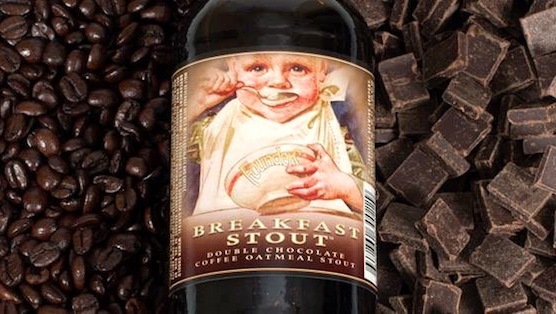 The resulting balance between bitter and sweet make the Breakfast Stout hearty enough for its namesake meal, sweet enough for an after-dinner dessert brew, and bold enough to sip with a cigar out on the deck.